We are all working harder these days– especially in the United States. According to the International Labour Organization (http://www.ilo.org), Americans work 499 more hours per year than the French. We’re putting in more time, but many aren’t yielding the necessary results needed to stay on top of their to-do lists. So what happened to greater productivity through technology? While technology has made our world smaller and made it easier for us to communicate with our family, friends and colleagues across the globe, it has also increased the potential for distraction during our work process. I’ve diverted my attention away from this article several times to answer an email, reply to a text and answer my iPhone. Most of us are guilty of being distracted, it’s almost inevitable; but we can control the number of tasks in work and life that we take on at one time. 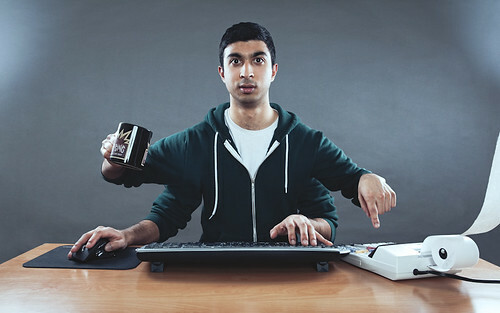 Multi-tasking is just a way of life today but don’t fall into the trap of thinking that juggling multiple tasks is necessarily more productive. As companies downsize, workers find themselves doing their work plus the work of those who have been let go. This leads to greater stress and burn out. It’s more important in this downsizing era to efficiently collaborate with colleagues, delegate tasks (if you have the power to do so) and work on your to-do items in a way that allows you to bring some type of closure before shifting your focus to something else. We show that task juggling, i.e., the spreading of effort across too many active projects, decreases the performance of workers, raising the chances of low throughput, long duration of projects and exploding backlogs. Individual speed of job completion cannot be explained only in terms of effort, ability and experience: work scheduling is a crucial “input” that cannot be omitted from the production function of individual workers. We provide a simple theoretical model to study the effects of increased task juggling on the duration of projects. Using a sample of Italian judges we show that those who are induced for exogenous reasons to work in a more parallel fashion on many trials at the same time, take longer to complete similar portfolios of cases. The exogenous variation that identifies this causal effect is constructed exploiting the lottery that assigns cases to judges together with the procedural prescription requiring judges to hold the first hearing of a case no later than 60 days from filing. Multi-tasking can make you more productive if you juggle with a plan. It will ensure that you won’t drop any of the balls in play! For a list of suggested tips on ways to properly multi-task, sign up for the Inclusion Solution eNewsletter here.